Good morning & Happy Friday, BB addicts!! :D Last night, we learned that Spencer won HOH. He will have to nominate 2 houseguests for eviction this week & according to what Spencer said last night, it looks like it might be McCrae/GM with McCrae as the target. Being the HOH, Spencer had to hand out 3 punishments & I prize. He made McCrae/GM get chained together for 24 hrs (*Memories of Brendon/Britney flood my mind lol), Judd has to do pushups/situps, etc for the next 24 hrs whenever a Drill Sargent comes over the loudspeaker, and it sounds like Andy has the chance to win $5,000 in an upcoming comp. GM is not happy about being chained to McCrae, though Spencer told her it was to prevent McCrae/Judd from being together & possibly forming an alliance. McCrae went to the D.R. to request booze. The Exterminators all celebrated. Spencer confirmed that McCrae is this weeks target. Spencer then shows his HOH key to the camera in hopes of his girlfriend, Marilyn, watching. Judd had said several times during the night about how happy he is now that Elissa is gone. BB gave the HG's some arts & crafts stuff to keep them busy. GM/McCrae/Judd/Andy were in the living room, waiting for Spencer to come out from the D.R. Judd was anxious to see what CD BB gave him. They all talked about how nervous their families must be during live eviction nights. Andy: "My mom probably had 3 strokes already." They also talked about jury; how all the girls are in jury and who they think is the most vengeful: they agree that it's probably Jessie. Judd, again, kept talking about how happy he is now that Elissa is gone. Andy: "F**k you, Zingbot! This floater is in the final!" Spencer: "I'm gonna put him (Mc) up, and probably Judd. He thinks there's a guys alliance so, I'll put you up (GM) but it doesn't give a f**k, it doesn't matter, (McCrae) is going home. If he (Mc) comes down, Judd goes up, Judd will go home." GM: "So you're gonna put me & McCrae up?" Spencer: "If I do, Judd will be the replacement nom. You put me up twice, so I thought I could use that." McCrae gets his HOH basket. Meanwhile, GM is a little upset that her/McCrae are going to be chained together. GM: "He's like, the dirtiest person.."
Spencer says he should've put GM with Judd instead. He was just worried about Mc/Judd making a deal together if they were chained for 24 hrs. McCrae reads his letter from home, it's from his sister. He immediately starts to tear up and smile. McCrae: "I don't wanna do this.."
Judd: "You don't have to if you don't want to." 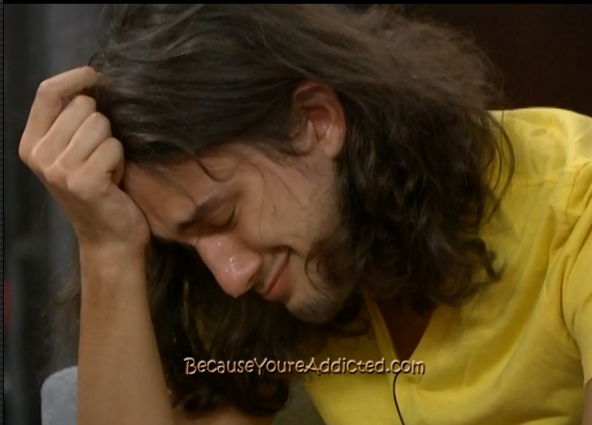 McCrae: "If you're reading this, then that means you're HOH. Mom and Dad are so proud of you..."
McCrae pauses for a moment. GM: "It's alright, buddy. You don't have to (read it)." Judd: "Is everything ok? Or is it just heavy?" Judd & Spencer hug McCrae. Judd had to do 50 jumping jacks part of his punishment. Spencer told Judd he's nominating McCrae/GM. McCrae/GM are linked up now & will be for 24 hrs with a "Friendship Bracelet". Spencer got his HOH room! They gave him beers in his HOH fridge, plus his HOH basket & a letter from his girlfriend, Marilyn. BB: *whistle blows* "Give me 10 sit-ups, little girl!" GM is pounding on his stomach (lightly) as he does his sit-ups. BB: "You are 1 day closer to...five..hundred...thousand...dollars." **And that's it for The Overnighter!! It's noteworthy that McCrae offered a Final 2 deal to GM during the night, but then she told the rest of the Exterminators about it. As of 9:02am BBT, all HG's are still sleeping. amazing that these are the clowns left and one of them will win. Not a bad move from the perv to keep mcc and Judd apart though. I wonder if BB considers this a successful season, since ratings were up. Wouldn't it be more interesting if they upped the $$ to Survivor level and brought in a more diverse slate of players? I think Spencer is missing an opportunity with his noms. I think it's a mistake for him to nom McCrae. If he kept him off the block and tried to even convince him he wouldn't be the renom he could even subconsciously lessen McCrae's motivation to win POV. Plus if McCrae did win POV and was going to stay anyway he'd believe he was working with Spencer next week. With the solid 4 person alliance and McCrae this week is kind of like F4 week where it's all about POV and it wouldn't matter if McCrae was up or not cause POV would be used by everyone to get him out anyway. I was surprised last night when Julie went so easy on Amanda. Amanda had several racial comments while she was in the house, but she wasn't confronted on them by Julie like Aaron was. Why does Mccrae get an hoh basket? Jamie, you mentioned an eviction on Sunday. What did you mean by that? There's a "surprise eviction" that will be aired on WEDS's BB episode, which means it'll likely take place on Sunday or Monday so that they can edit it in time for Weds. Then on Thursday, there's a normal live eviction (last Thurs live eviction of the season). Finale on Weds the 18th. That's because none of Amanda's racist comments were on the show she got the bully edit. She did ask her about how everything she did and said went out on the internet and if there was anything she was sorry for which did kind of hint at it though. Aryan got the racist edit and is gonna take the full brunt even though it wasn't just her making such comments. BB wasn't gonna just show a house full of people making racist comments as that wouldn't look good for them so they make it look like 1 bad apple and put it on Aryan as people in the house were talking about her being racist early on. GM will get away with the most as at least Amanda got a negative bully edit. GM has said some of the most disgusting things and the only negative thing that made air was the Candice fight when she was evicted cause it was live. He gets the HOH basket because he won HOH in the DE. They always give that person at least their basket and letter to be fair because they did win even though the don't get the room. Aryan got hers same thing in the 1st DE. That means they'll be blacking out the feeds from when they tape the eviction until after the show airs on Wed on the west coast right? Amanda's comments were more politically incorrect than racist. At least she talked about the bullying of Elissa, which I think is the main thing people will take away with them when they think of Amanda. I really hope GM goes next, and then Spencer. I can't believe how kind BB are on him in the edits! Completely agree. She had a lot of nasty comments and racial slurs. @Brian Yea, that's what I'm guessing. That's what they've done in the past. Usually people are upset when they blackout the feeds for that long. This season I think most will welcome it! Especially if McCrae doesn't win POV then the week is over anyway and they can just black it out right after that for all I care! Why did Judd get so mad at Elissa? W hat happened? Was it cuz she flipped on Amanda? Amazing to hear McRae planning to move to FL...Thats one relationship Id like to see outside the house. Its hard to believe Amanda doesnt have a short fuse in real life. You cant just act like that, but maybe she never gets cornered in her real life cuz shes gotten what she wants. Its hard to believe the show is almost over...This is where it gets boring. (I bet Andy has a f2 with everyone...He still is in good with McRae; I think he has one with Spencer; he told GM he wouldnt put her up; he probably is in good with Judd too...But if they all TALK, he could get outed and become the target but I dont think that will happen. But the bottom line, is why should they pay out more? Its not going to affect casting, and its not going to improve ratings. People dont watch the show cuz of prize money. Look at X Factor, they promoted over and over the $5 million prize and it didnt product a mega star (Idol doesnt have that kind of cash prize) or help ratings at all. After 2 failed season of hyping the biggest prize ever, theyve lowered the prize this season. I've heard rumor this is the last season for Big Brother. Even tho this season's cast has been "appalling" and less than entertaining to watch, I've seen every episode since season one and would hate to think of life without big brother :-(. Any idea if there is truth to this being the last season of Big Brother? I'm looking forward to getting my time back, as Brian said, if McCrae doesn't win POV I'm sure not going to spend the rest of my week watching this Confederacy of Dunces pick the lint out of their navels..
B Scott: highly doubt it. the ratings were good and fans will be eager to get a new/different season. all the "rumors" this year thus far, have been proven false. It's amazing how people all season have let Andy get away with his self-serving double dealing actions. When it was to get McCrae to put up Elissa so that she'd be evicted instead of 1 of them ok it made sense to go along with that as long as Elissa didn't win POV. But now that she's gone and it's just the 4 of them and McCrae there's absolutely no purpose for them to keep helping him perpetuate the lie other than to aid him in making sure they go home instead of him if McCrae keeps winning comps. So glad Elissa is gone, she was SOOO boring to watch in the house. What a basket case Elissa is.